Havana Rakatan are back in Town!! Experience the authentic heart and soul of Havana this summer – right here in London! 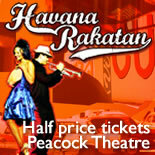 The legendary Cuban dance show, Havana Rakatan, returns to the Peacock Theatre by popular demand for it's 5 year – with new music and new choreography! Set to the infectious rhythms of live Cuban band, Turquino, Havana Rakatan is a captivating and colourful journey through the dance and music of this truly unique country. The sultry rumba, mambo, salsa, jazz, bolero and cha-cha-cha all come alive in a whirlwind of Cuban passion guaranteed to “have you bouncing in your seats” (METRO). Call 0844 412 4322 and quote “Salsa offer” or go to www.sadlerswells.com/havana and enter the promo code pcdsalsa when prompted. *Offer subject to allocation availability. Not available retrospectively or in conjunction with any other offer. Transaction fee applies. © Amanda Maitland, All rights reserved.